If you’ve been a guest of ours before, I hope you have had the pleasure of meeting Vickie Hudson. In addition to being our head concierge and one of the nicest people you’re likely to meet, Vickie is also incredibly talented at what she does. 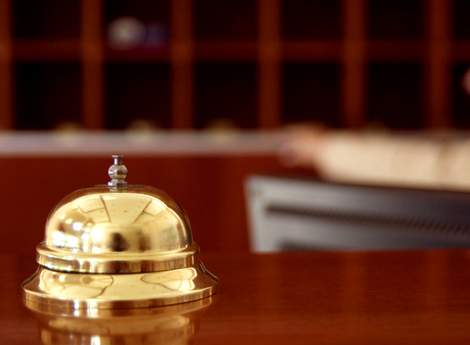 So, what does it take to be a concierge for a five-star, five-diamond luxury hotel? I sat down with Vickie on Friday to talk about some of her more memorable experiences and she shared her favorite (and not-so-favorite) parts about the job. One of my favorite things to do is to help guests plan the perfect proposal. In order to get it just right, I try to listen carefully and get a sense of the couple and their “story.” Then I suggest ways in which we can customize the proposal to suit those needs. To help one groom “pop the question”, I put together a detailed scavenger hunt in one of our guest rooms that ended in the bride finding the queen of hearts card to symbolize how she had captured his heart. For another couple that wanted total privacy in a natural setting, I arranged for a violin serenade in the forest for just the two of them. I love that by participating in creating these moments, I’m helping to create memories that will never be forgotten. The most challenging part of my job is handling requests that must be accomplished in relatively short windows of time. For example: I had a guest that was dressing for an important event that tore her dress and needed a professional seamstress on site to repair it within minutes. Another time, a guest called in the middle of the night on a weekend needing a massage as soon as possible. We succeeded in accomplishing both of these tasks, but it was not without a great deal of behind-the-scenes orchestration. The bottom line? We are a five-star, five-diamond hotel and nothing is outside of our capabilities. Prior to joining The Hermitage Hotel, I served as concierge for another large hotel and it was there that I was given my most difficult challenge. We were hosting out-of-town guests conducting a medical symposium during which a new suturing technique would be demonstrated. The guest realized on the day of her event that she did not have the key component of that day’s lesson: the 40 raw pig’s feet on which the participants would practice the new suturing technique! Several phone calls to local butchers later and less than an hour later I had the needed trotters—just in time for the show to go on. This is just a short sampling of the stories that Vickie shared with me. I wish you could see the passion with which she takes care of each and every guest that graces this grand hotel. The next time you visit us, stop by the concierge desk and talk to Vickie herself—I’m sure she has a few ideas on how she can personalize your stay. P.S.–Follow us on Facebook and Twitter to keep up-to-date on the latest news, contests and giveaways. Search “The Hermitage Hotel” on Facebook or find us @hermitagehotel and send us a tweet!